The automotive enthusiast gene never found its way into my family DNA. My father drove a Chevy Suburban because he needed something large and stout to carry mattresses to local clients. 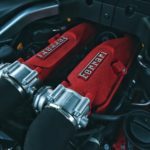 The fact that the truck had a small block V8 and could actually dust some budget sports cars off the line mattered not – it was merely a tool. My mother, to her credit, once had a strong affinity for Alfa Romeo Spiders, but by the time I came along, she’d settled into Volvo 850 ownership. The wonderful quirks of the turbocharged, Swedish-built saloon were lost on her – it was just a safe sedan. The only reason motor oil leaked into my blood stream was because of an impassioned neighbor. Most days after school, my neighbor’s son and I would grab our buff books and wander into his garage in search of automotive knowledge. His collection afforded ample research material. 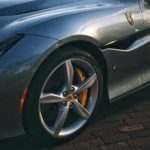 A Triumph TR3, Porsche 928, 1967 Mustang coupe, and Jaguar XJ6 served up driving thrills in very different ways, but the real treasures were a pair of Ferraris. An Azzurro Metallizzato (baby blue) 328 GTS and a Rosso Corsa (very red) Testarossa made my heart flutter like no cars had before. Today, I’m fortunate to drive all manor of fast, beautiful automobiles, but my time in Ferraris has been woefully limited. 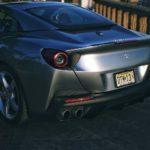 When I was 18, I drove an F430 around Monaco (timidly), and two years ago, I had a short jaunt in a California T. Hardly enough time in either case to put emotions into words. And so, with a weekend of seat time in the all-new Ferrari Portofino ($214,533), I will at last give the Prancing Horse its due. 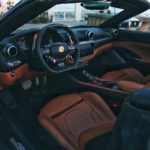 Aesthetically, the outgoing Ferrari California T was not an easy car to love. Its long nose and short overhangs were classic front mid-engine sports car, but a steeply raked roofline and prominent rear diminished curb appeal. 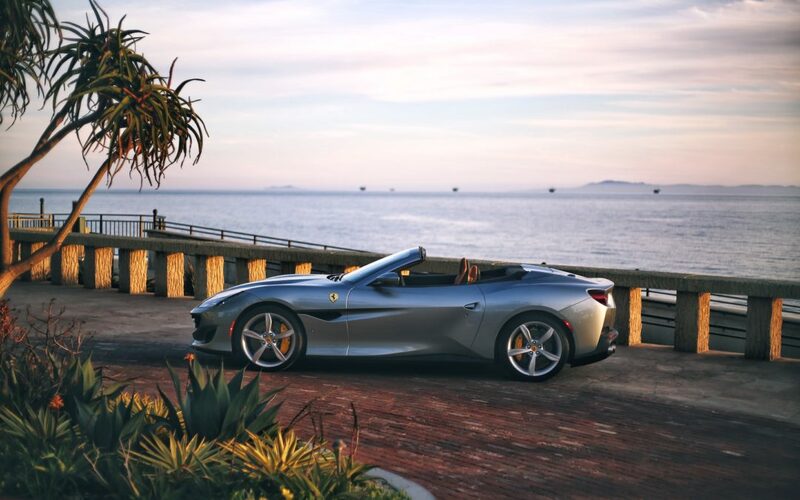 With the introduction of the Portofino, Ferrari addresses the California T’s stylistic shortcomings to deliver a spectacular GT physique. With the three-piece folding hardtop flowing gently into the wider, narrower rear end, the Portofino adopts a striking fastback silhouette. At the front, the Portofino’s expressive face includes sculpted air inlets, a grinning grille, and flowing headlights. The hood incorporates a pair of grooves and heat extractors. In profile, the Portofino’s five-spoke matte gray wheels leave plenty of room for the optional yellow painted calipers to shine. Raised, extended haunches give the car a powerful stance. 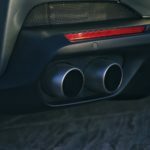 Oversized quad exhaust ports and a dramatic diffuser visually lower the Portofino’s behind. My tester’s Grigio Titanio paint is on the subtler end of the supercar spectrum, but it traces the vehicle’s character lines beautifully. 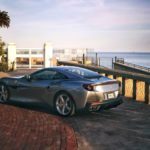 Certainly, the Portofino’s design is the most assertive of its convertible GT rivals, which include the Aston Martin DB11 Volante and Bentley Continental GT Convertible. In 14 seconds, the Portofino’s roof tucks neatly under the trunk panel, revealing one of the most exquisite cabins of any roadster on sale. 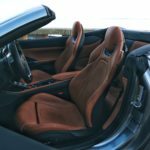 Cuoio colored leather adorns the 2+2 seating configuration, console, door inserts, and lower half of the dashboard. Elsewhere, black hide trims the upper dash, steering wheel inserts, and deck lid. 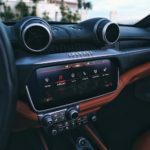 Brushed metal accents are used for the round air vents, Portofino and Ferrari badges, and console controls. 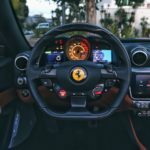 No one fashions a steering wheel like Ferrari; the shape and intricacy makes any driver feel like part racer, part monarch. 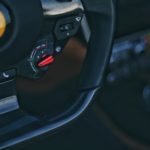 The kid in me wants to press every button and flick every toggle (which I do), but the truth of each control is that it has a specific function, ultimately allowing the driver to keep both hands on the wheel at all times. 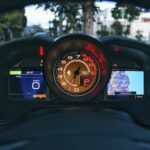 Equally arresting is the gauge cluster, complete with a centered, supersized tachometer (available in a number of hues) and two digital monitors. To the driver’s right is a stepped arrangement for the reverse gear, manual/auto shift selection, and launch control system. An ideal blend of analog and digital, the Portofino’s interior is an elegant, comfortable, and intriguing home for road trip enthusiasts. There is one catch, however: cargo volume. With the roof stowed, the Portofino fits little more than two carry-on bags in its trunk (similar capacity to its main rivals). Those needing more versatility must store parcels on the foldable rear seats (which lack sufficient legroom to host adults). 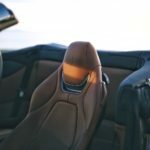 The Portofino is among the more technologically sophisticated performance vehicles I’ve encountered. It certainly isn’t lacking in digital real estate – I count four screens scattered along the dashboard. Drivers can adjust a pair of monitors on either side of the tachometer to summon navigation, media, telemetry, and speed readout information. Because both displays are so recessed, neither is impacted by glare while the top is down. A 10.2-inch touchscreen infotainment sits between the front passengers and offers crisp visuals, an intuitive menu, and quick response to inputs. An optional 8.8-inch screen is delicately integrated within the passenger side dash and shows a truncated assortment of performance and entertainment data. Convenience goodies are on par for the grand touring set, including heated, 18-way adjustable seats, Apple CarPlay, a premium JBL audio system, and front and rear backup cameras. 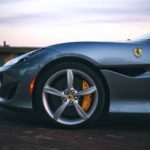 As is the case for most supercars, driver assistance features are not available. 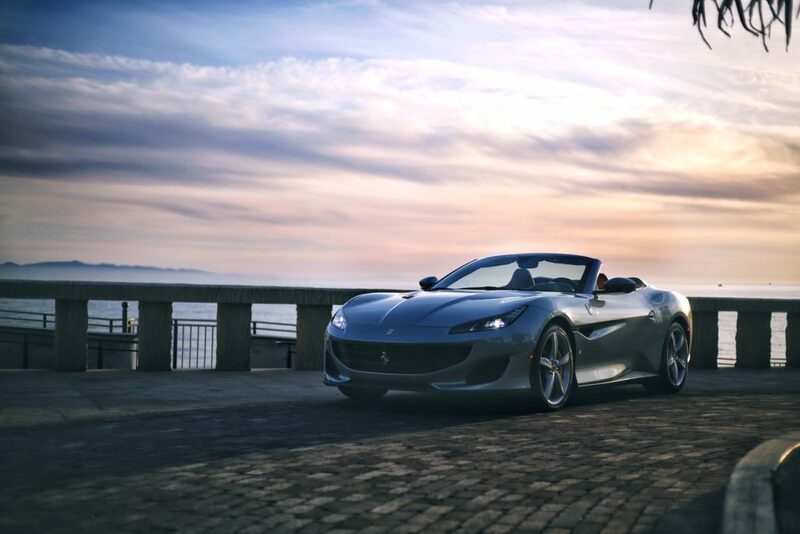 Even if conceived for long haul comfort, the Portofino is to be driven intentionally, not absentmindedly. My short drive in the California T wasn’t near enough time to make comparisons with the Portofino’s driving experience. As such, I can only comment on the Portofino’s superb balance of ride quality and performance relative to other GT drop-tops. 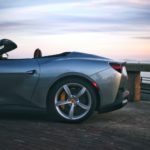 At just 3,700 pounds, the Portofino is significantly lighter than the DB11 Volante (~4,100 pounds) and the Bentley Continental GT Convertible (~5,300 pounds), meaning it changes direction, brakes, and accelerates more eagerly than its rivals. 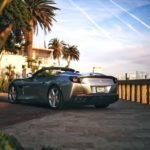 Propelled by a 3.9-liter twin-turbocharged V8, the Portofino produces a robust 591 horsepower and 561 pound-feet of torque. 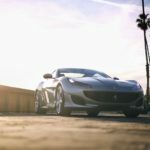 A seven-speed dual-clutch automatic transmission sends power to the rear wheels, firing the Portofino to 60 mph in 3.2 seconds and on to a top speed of 199 mph. 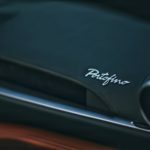 With the drive mode toggled to Sport, the Portofino issues an initial bellow on throttle tip-in before changing its tune to sonorous wail in the upper rev range. 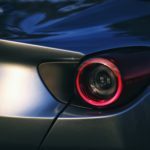 Changing gears via one of the car’s massive carbon fiber paddles is a treat for any tactile individual; with a satisfying “click” and a trigger-like action, the Portofino emits an addictive “fwomp” from the exhaust as the nanosecond shift occurs. 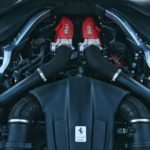 Porsche may contend with Ferrari for dual-clutch engineering, but the contest for engagement is easily decided. 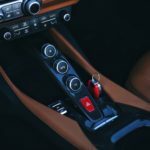 In its automatic setting, the Portofino swiftly works between gears and doesn’t hesitate to upshift (even in Sport) unless sufficient throttle input is detected. Moseying about in the city, I’m quick to disengage the start/stop system. Failure to do so results in somewhat rough ignition and a pause before the dual-clutch is engaged. 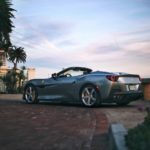 A long drive up the SoCal coast affirms the Portofino as a proper GT and a true Ferrari. With the top down and windows up, wind buffeting is minimal, allowing my wife and I to converse easily without becoming hoarse. Ergonomic, supremely comfortable seats keep us feeling fresh throughout the journey. The adaptive suspension, which allows independent softening of the dampers while keeping the drivetrain in sport, beats road imperfections into submission. The steering, which reacts urgently to inputs, never becomes fidgety while cruising. 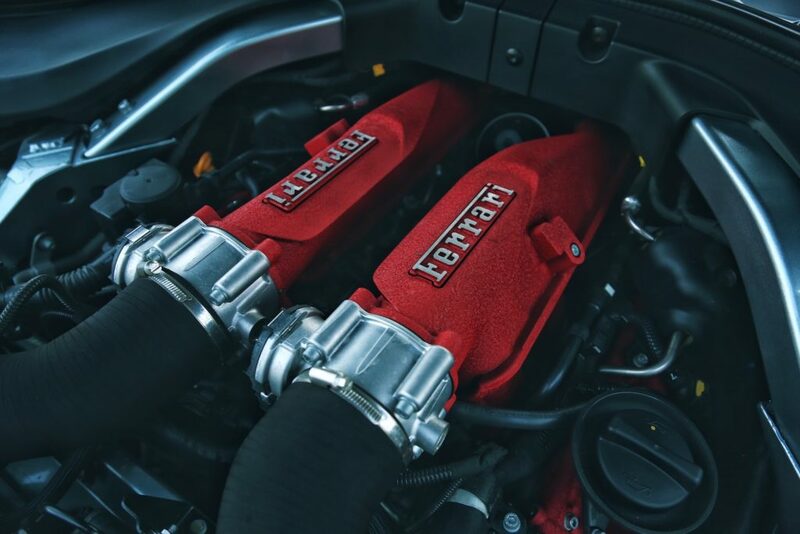 A mere brush of the throttle at highway speed gets an immediate and potent response from the forced induction engine. 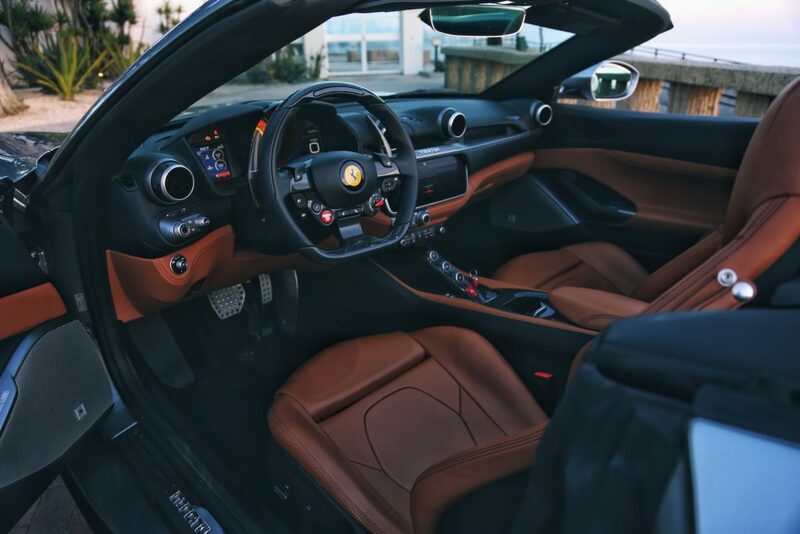 When greater performance is required, the Portofino demonstrates its Ferrari lineage with incredible chassis control and communication. This is sheer driving bliss. 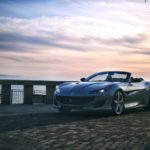 The Ferrari Portofino runs with a tough pack of British-build GT candidates. Aston Martin’s DB11 Volante ($219,32) benefits from an AMG-sourced 4.0-liter twin-turbocharged V8, delivering 503hp and 498 lb-ft of torque. 0 to 60 mph takes 4.1 seconds and VMAX is 187 mph. Bentley’s answer to the call for a plush, high-output vehicle is its all-new Continental GT Convertible. 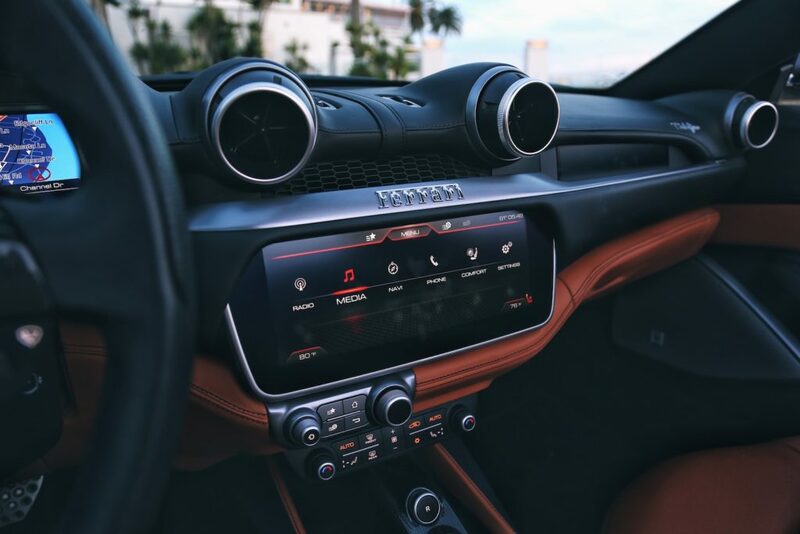 Utilizing an all-wheel driver system and a massive 6.0-liter twin-turbo W12, the Conti GT makes 626hp, hits 60 mph in 3.7 seconds, and tops out at 207 mph. Aesthetics will likely settle the minds of buyers, but the Portofino holds a clear edge in terms of performance. 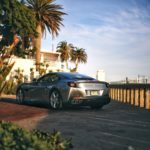 I feared my experience with the 2019 Ferrari Portofino would be marred by memories of the gated manual, naturally aspirated, raw stallions of my youth – that the contemporary car couldn’t possibly live up to those first loves. In truth, it doesn’t – and that’s a good thing. 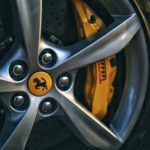 Breathtaking though they were, the 308 GTS and Testarossa were punishing, demanding sports cars that wouldn’t hesitate to bite even a talented driver. The Portofino, by comparison, is magnificently composed, accessible, and comfortable. The sense of excitement and level of stylistic beauty delivered by the Portofino are now as indelibly pressed in my mind as those ancestral Ferraris, but this is a vehicle I could genuinely drive ever day. 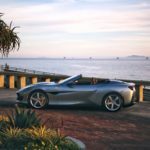 Ferrari’s convertible GT isn’t just captivating (like Aston Martin’s DB11 Volante) and isn’t merely plush (like Bentley’s Continental GT Convertible) – it wraps each of these attributes in an unparalleled driving experience deserving of the Scuderia Ferrari shield.